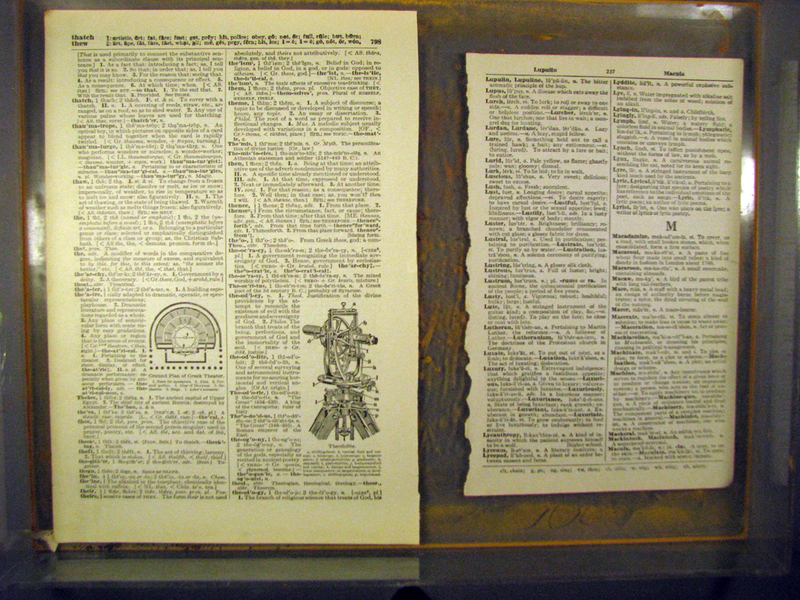 Click on the picture to see a larger view. 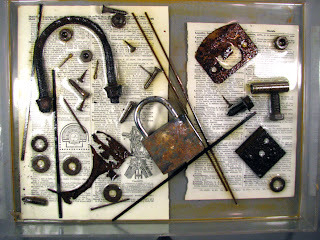 Hello again all you fellow steampunk enthusiasts! 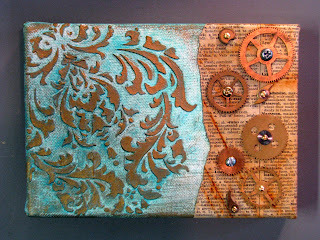 Here is my second tutorial and I am going to show you how to make rusty paper like the piece you see under the gears in the canvas pictured above. (Don't worry, I am going to show how to make the completed canvas too.) I think this is a basic must if you want a good background to make anything steampunk..... and it is super easy. 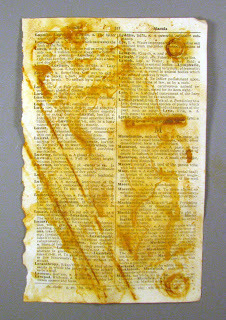 piece of rusted paper about 6"x9"
1. 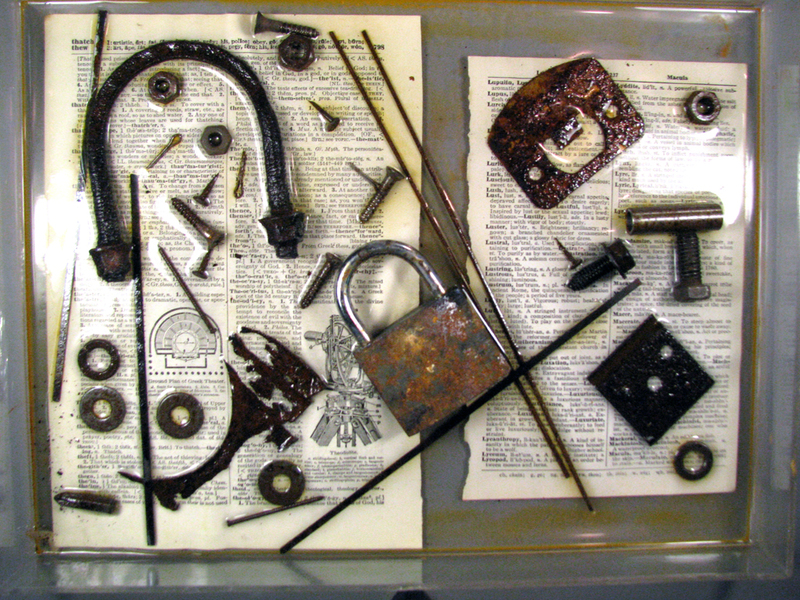 Collect an assortment of rusty objects and old paper you want to make rusty. 2. Place as many pieces of paper in your tray as you can get without overlapping them. 4. Place the rusty objects all over the paper in a random fashion. 5. 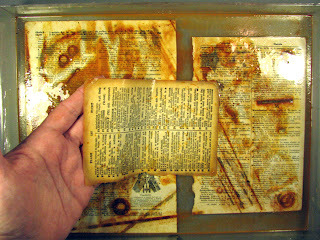 Pour in enough water to cover the paper and touch all the rusty objects from underneath. 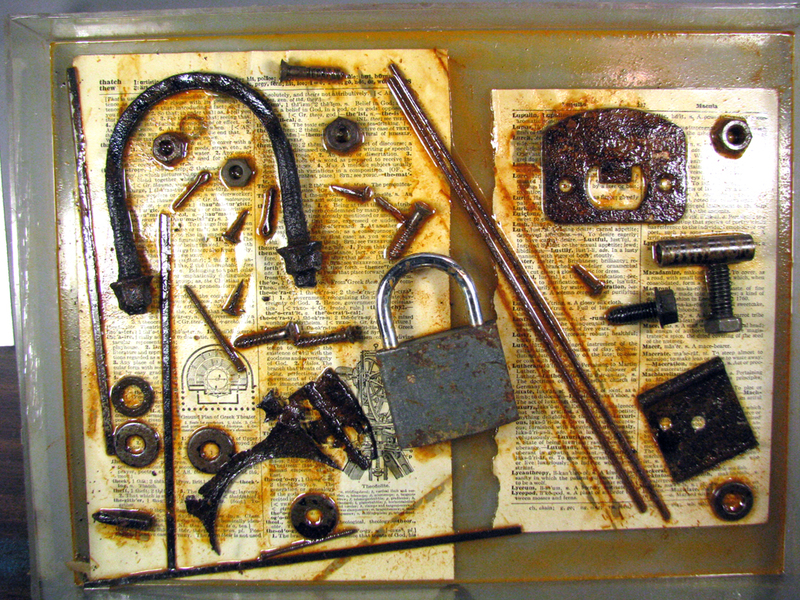 This is how rusty it looked after only one hour of soaking. This is how it looked the next morning. This is how it looked later that afternoon. (Notice the water has almost all dried up.) 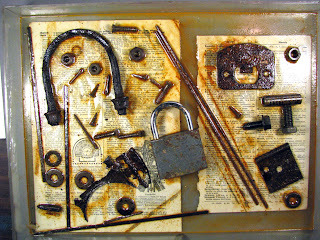 If it hasn't rusted as much as you would like just spray it with a water bottle to re-wet everything. 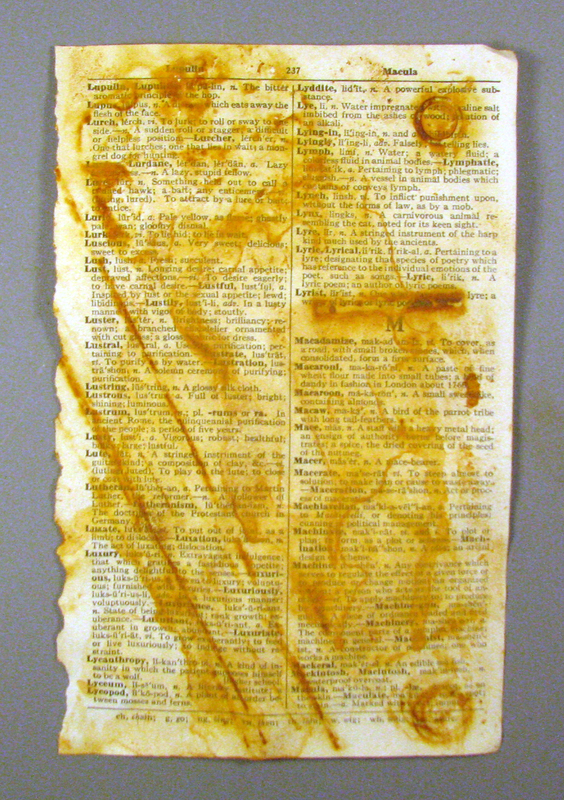 NOTE: All of this paper will have to be sealed in some way or the rust will rub off, and any sealer will make the rust appear darker. OK..... So now we have some rusty paper. What do we do with it? 2. 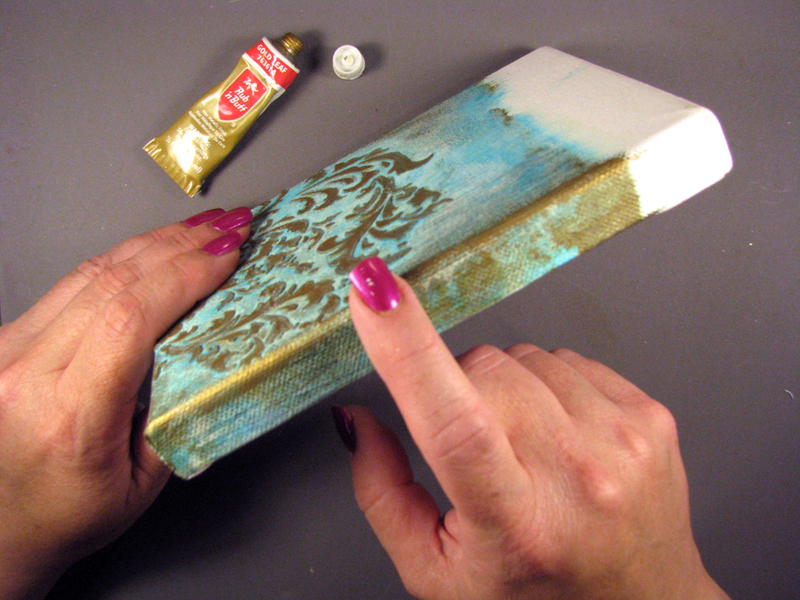 Get some stencil paste on a palette knife and wipe it across the stencil. 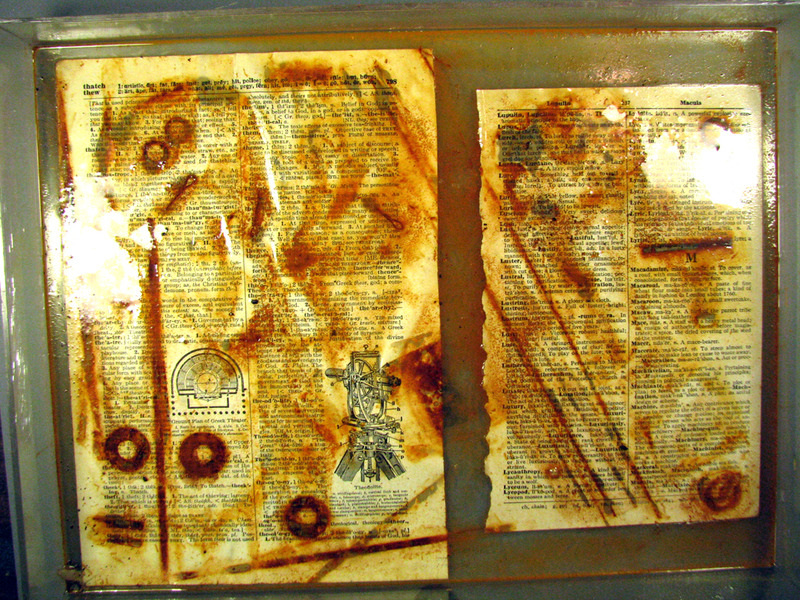 Try not to wipe it too hard or you'll force the paste under the stencil and "blur" the image. 4. 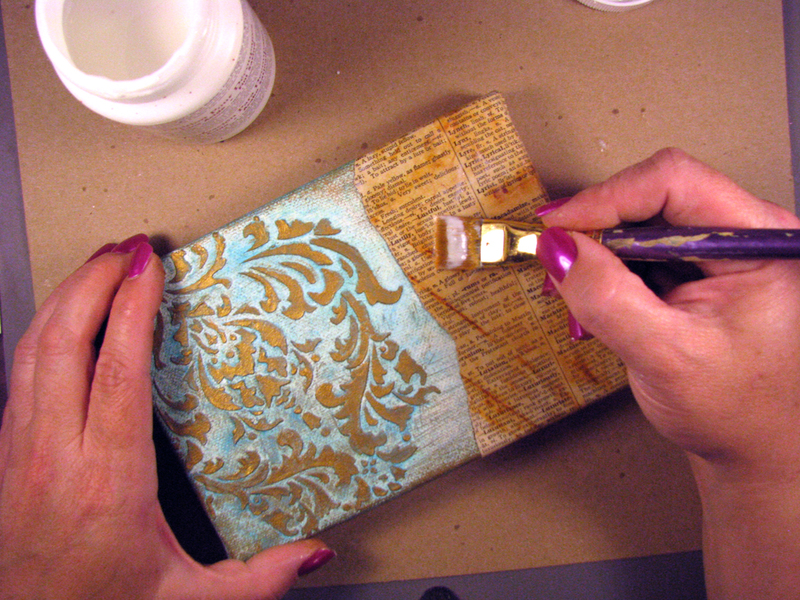 After the stencil paste has dried (preferably overnight) paint it with the Gold Metal Finish paint. Let the first coat dry completely and then add a second coat. 7. (Optional) I also took some more of the Gold Leaf Rub-N-Buff and rubbed it along all the edges of the canvas. 8. 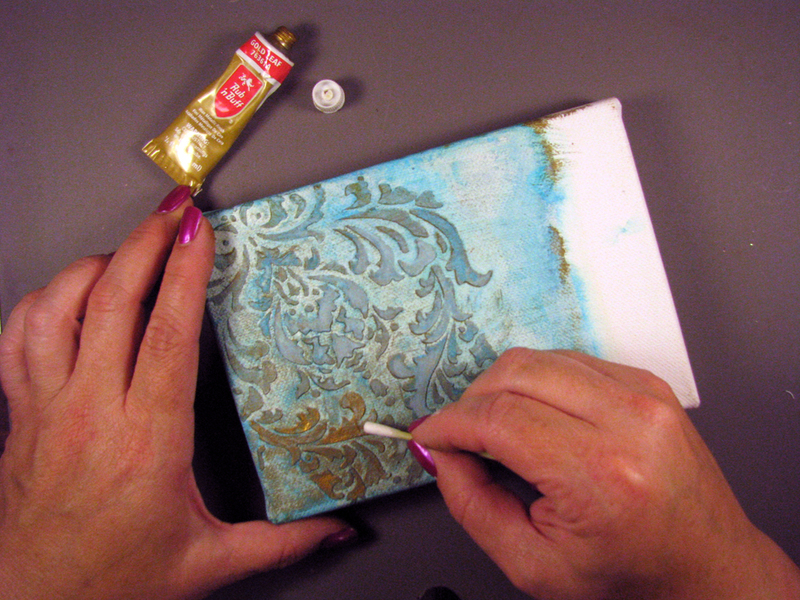 Tear one edge of a piece of rusty paper then position the paper on the right hand side of the canvas. Take a pencil and mark the edge to make it easier to place the glue. 10. Glue the sides of the paper to the canvas then clip the corners. 11. 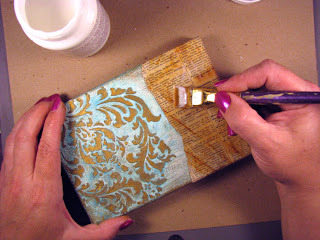 Glue the smaller flap to the end of the canvas on both sides. 12. 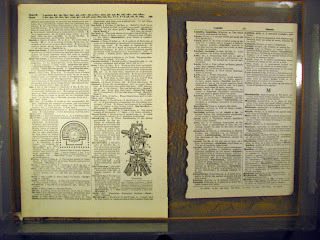 Glue the end of the paper to the canvas. 13. While the paper is still wet from the glue tear the edges even with the canvas. If you prefer you can simply glue them around to the back. I didn't do this because I have other plans for the niche created on the back of the canvas. Just a quick note about this piece. I wanted to do a hinged 2 piece canvas but I decided to keep this one simple. I will eventually finish the second canvas and add something to the niche in the back of both canvases that is created by the wooden canvas stretchers. If you want to see the rest just keep an eye on my blog. This is clearly not a quick project - I admire the focus you put into your art, and the time you are willing to spend to get just the results that you want. Wow. This is so cool. Great tutorial. Off to find some rusty junk!!! What a great tutorial. 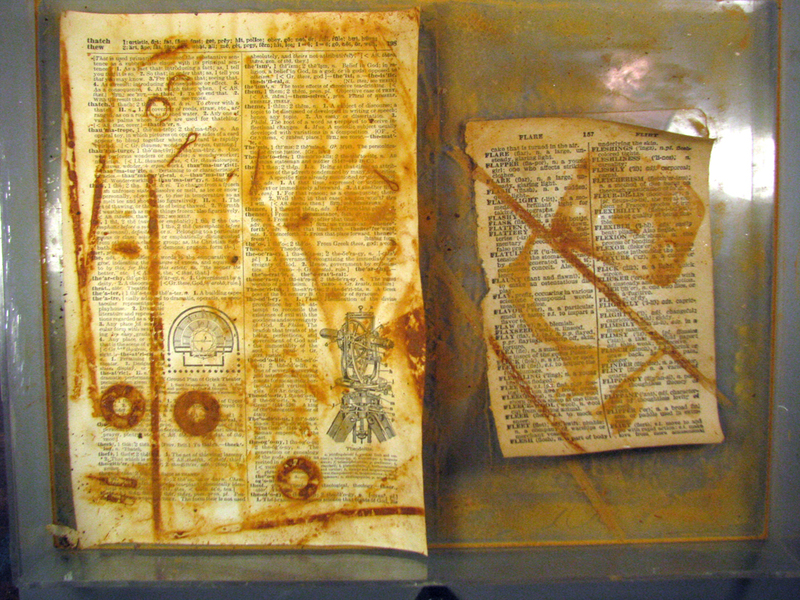 Thanks for sharing your rusty paper and the rest of the canvas. Can't wait to see the niche part of this. Wonderful tut...I learned alot. Your art piec is amazing too. Thank you. I had no idea t was this involved, the results are well worth it. Gorgeous, thanks for sharing. Now I gotta try the rusty paper idea, way cool! Thanks for your wonderful words! After 3 wonderful years of Gingersnap Creations, the Founding Femmes and Gingers are off on new adventures! 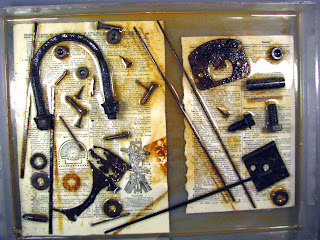 As of April 2012, Gingersnap Creations has transformed into a new blogozine, Unruly PaperArts, complete with tutorials, interviews, reviews, and unruly art and articles by our regular columnists and guest contributors. 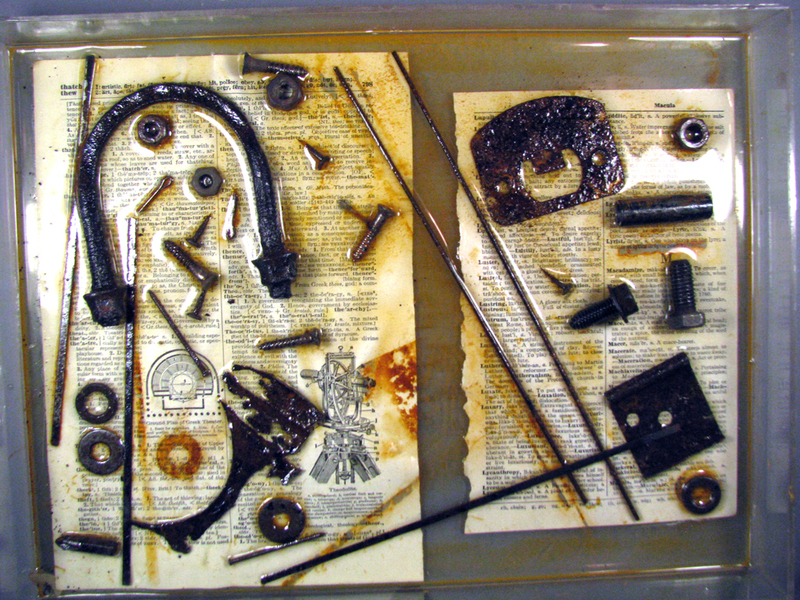 Come play our monthly Reader Art Quests and have your art featured in the next issue of UPA. Blank Page Muse Stamps: Hippity Hop at Easter! Electra: Wishin I knew how to blog. 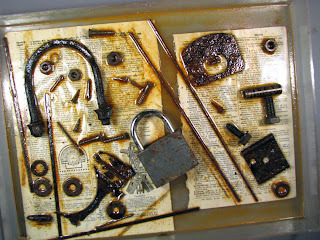 Peggy Gatto: peggy's mixed-up art! HMFMC #289 - Always Anything Goes/ Optional theme "SPRING"
Stampington & Prima have a great giveaway! Please note: past visiting artists and Muses who were also Gingers, the Gingersnap Creations Design Team, are not in this list. Please refer to our Past Gingers list to link to their amazing art! All content, including text, photographs and concept design work are © Sharon Briss or © Alison Manning or our current or prior design team members unless otherwise stated. 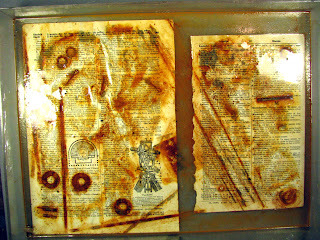 Stamp images used are copyrighted by the companies credited. Designs and ideas for inspiration only. Designs may not be copied for the purpose of sale, publication, or contest submissions. Thanks! Please note that some of the products that are used on our blog have been supplied by the vendors mentioned in our posts.